38 www.coalage.com April 2018 blasting continued a 10-in. borehole. This is just one reason why stemming is critical. But, is the in- crease in burden and the associated in- crease in spacing the only impact? 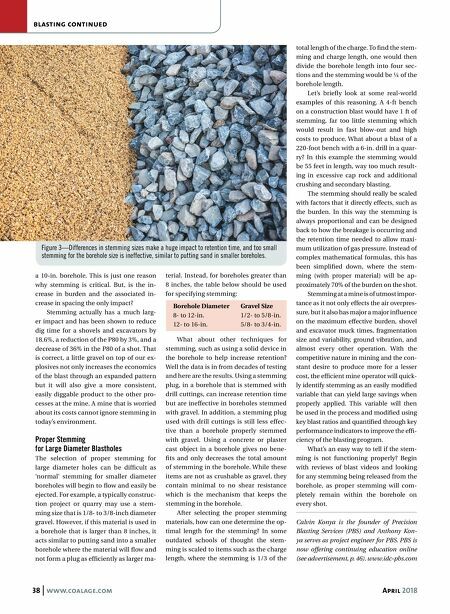 Stemming actually has a much larg- er impact and has been shown to reduce dig time for a shovels and excavators by 18.6%, a reduction of the P80 by 3%, and a decrease of 36% in the P80 of a shot. That is correct, a little gravel on top of our ex- plosives not only increases the economics of the blast through an expanded pattern but it will also give a more consistent, easily diggable product to the other pro- cesses at the mine. A mine that is worried about its costs cannot ignore stemming in today's environment. Proper Stemming for Large Diameter Blastholes The selection of proper stemming for large diameter holes can be difficult as 'normal' stemming for smaller diameter boreholes will begin to flow and easily be ejected. For example, a typically construc- tion project or quarry may use a stem- ming size that is 1/8- to 3/8-inch diameter gravel. However, if this material is used in a borehole that is larger than 8 inches, it acts similar to putting sand into a smaller borehole where the material will flow and not form a plug as efficiently as larger ma- terial. Instead, for boreholes greater than 8 inches, the table below should be used for specifying stemming: What about other techniques for stemming, such as using a solid device in the borehole to help increase retention? Well the data is in from decades of testing and here are the results. Using a stemming plug, in a borehole that is stemmed with drill cuttings, can increase retention time but are ineffective in boreholes stemmed with gravel. In addition, a stemming plug used with drill cuttings is still less effec- tive than a borehole properly stemmed with gravel. Using a concrete or plaster cast object in a borehole gives no bene- fits and only decreases the total amount of stemming in the borehole. While these items are not as crushable as gravel, they contain minimal to no shear resistance which is the mechanism that keeps the stemming in the borehole. After selecting the proper stemming materials, how can one determine the op- timal length for the stemming? In some outdated schools of thought the stem- ming is scaled to items such as the charge length, where the stemming is 1/3 of the total length of the charge. To find the stem- ming and charge length, one would then divide the borehole length into four sec- tions and the stemming would be ¼ of the borehole length. Let's briefly look at some real-world examples of this reasoning. A 4-ft bench on a construction blast would have 1 ft of stemming, far too little stemming which would result in fast blow-out and high costs to produce. What about a blast of a 220-foot bench with a 6-in. drill in a quar- ry? In this example the stemming would be 55 feet in length, way too much result- ing in excessive cap rock and additional crushing and secondary blasting. The stemming should really be scaled with factors that it directly effects, such as the burden. In this way the stemming is always proportional and can be designed back to how the breakage is occurring and the retention time needed to allow maxi- mum utilization of gas pressure. Instead of complex mathematical formulas, this has been simplified down, where the stem- ming (with proper material) will be ap- proximately 70% of the burden on the shot. Stemming at a mine is of utmost impor- tance as it not only effects the air overpres- sure, but it also has major a major influence on the maximum effective burden, shovel and excavator muck times, fragmentation size and variability, ground vibration, and almost every other operation. 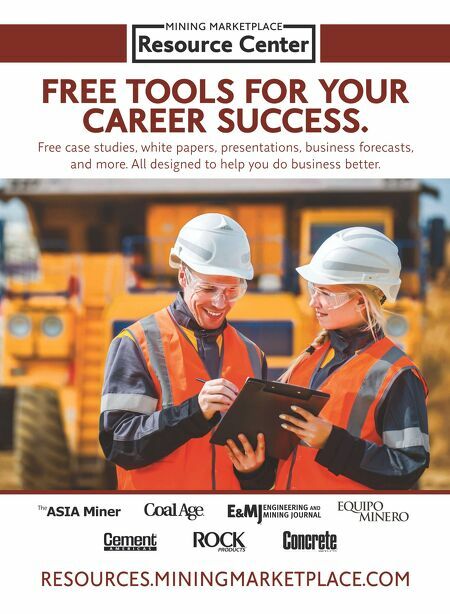 With the competitive nature in mining and the con- stant desire to produce more for a lesser cost, the efficient mine operator will quick- ly identify stemming as an easily modified variable that can yield large savings when properly applied. This variable will then be used in the process and modified using key blast ratios and quantified through key performance indicators to improve the effi- ciency of the blasting program. What's an easy way to tell if the stem- ming is not functioning properly? Begin with reviews of blast videos and looking for any stemming being released from the borehole, as proper stemming will com- pletely remain within the borehole on every shot. Calvin Konya is the founder of Precision Blasting Services (PBS) and Anthony Kon- ya serves as project engineer for PBS. PBS is now offering continuing education online (see advertisement, p. 46). www.idc-pbs.com Figure 3—Differences in stemming sizes make a huge impact to retention time, and too small stemming for the borehole size is ineffective, similar to putting sand in smaller boreholes. Borehole Diameter Gravel Size 8- to 12-in. 1/2- to 5/8-in. 12- to 16-in. 5/8- to 3/4-in.